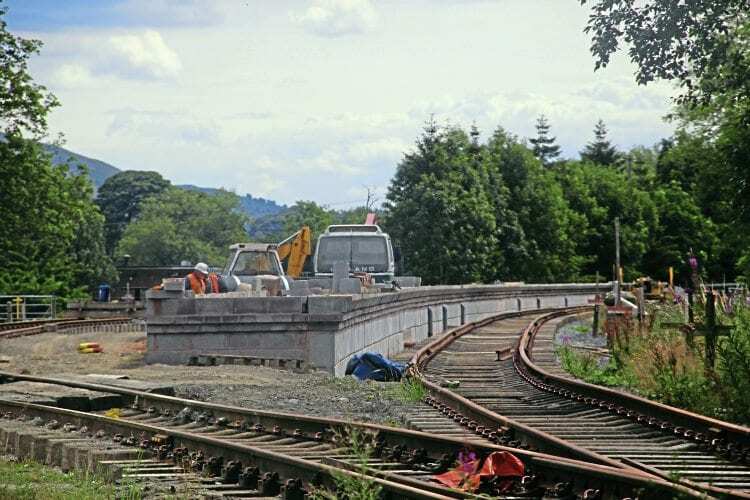 A NEW headshunt capable of accommodating a BR ‘9F’ 2-10-0 has been created on the site of the Llangollen Railway’s Corwen Central station as construction of the new western terminus pushes forward. Preparations for lengthening the headshunt involved dismantling the original ‘statement of intent’ stop block and surveying the ground that forms the remains of the original embankment out onto Green Lane, marking the limit of the 2010 Transport & Works Order. A small retaining wall has been erected using so-called ‘porcupine blocks’ and the ground level built up by around 3ft to allow for one and a half track panels to be laid. The stop block was reinstated once ballasting had taken place. Elsewhere on site the wall for platform 2 has been completed, while at the western end part of the back wall has also been completed and infilling has begun. It has taken more than six months of part-time endeavour by volunteers to complete the 510ft-long wall, equating to around £200,000 of paid labour.